The Bud Light Platinum Super Bowl 2012 commercial titled Work has been released. Watch the full Bud Light Platinum ad now below. 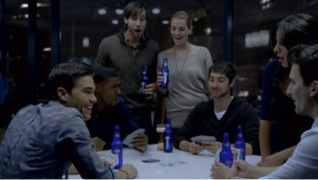 Anheuser-Busch is using the Super Bowl 2012 to launch the new Bud Light Platinum. With a slightly sweeter taste, higher alcohol by volume (6%!) and signature cobalt blue glass bottle, Bud Light Platinum is supposed an upscale light beer option. Anheuser-Busch has bought 4:30 minutes of advertising time during the Super Bowl 2012. Again the beer giant is one of the biggest Super Bowl advertisers. Anheuser-Busch has now released teaser videos of all Budweiser Super Bowl 2012 commercials. Find them all on Super Bowl Ads for Geeks.